Are You Desperately Trying To Grow Your Blog? So you have set up your lovely website, produced a good amount of high quality content, now what? How do you get your content out there? How do you get all that lovely traffic to your blog? Launching a blog and writing quality posts is only the beginning. You need to get eyes on your posts and I’m going to tell you straight, it’s hard and very time consuming. At least in the beginning. You should be spending way more time promoting your blog posts than you spend writing them. This doesn’t mean that you should rush your content creation, you always need to go for quality. So I would recommend writing no more than 2 blog posts a week to give you the time needed to market your blog. So how do you promote your blog posts? Where do you promote them and how often? What exactly should you be doing to promote your blog and drive traffic? Let’s dive in. Know your target audience. If you know your audience well you will be able to write content that they want to read. Hang out where your audience are online. Write a killer headline. Make people want to click through and read your post. Make sure that the majority of your content is evergreen. Your posts need to always be relevant to your readers, not just on 1 or 2 days of the year. Use good SEO from the beginning. Install google analytics and learn which type of content is your most popular so you can replicate it. Internal linking is a must. This is where you link to other relevant posts. The aim is to keep the reader interested and on your site for as long as possible. Give a great user experience. Make sure that your site has good design and is easy to navigate. Use images and short paragraphs to avoid huge chunks of writing. You could also use a bullet list like this one! All of these things make your content easier to read. Start an email list. This one may seem very daunting but believe me this is the one of the best things you can do for your blog. Be consistent. Whatever your blogging schedule, stick to it. Be patient, don’t lose heart and don’t give up. Your hard work will pay off. Be prepared to learn. A lot. I wasn’t prepared for how much I would have to learn when I first started. It can seem overwhelming but take your time and learn each topic thoroughly. I know now that a blogger is never done learning. Blogging is an ever changing enterprise and nobody can ever know it all. So you’ve written a killer blog post. Your headline is going to hook them in, you’ve solved a problem for your reader and it’s easy to read. Now what do you do? Most of us don’t realise how much content marketing is involved in blogging. We are under the impression that if we write a great post then people will read it. If only it were that easy. But don’t worry, it doesn’t have to be scary. I have a checklist of everything I need to after I hit publish, it keeps me organised. Here is a list of places you can promote your brand new blog post. Submit your post to google. Promote your post on Pinterest. Make 2 to 3 pins for each new post. Pin them to relevant niche boards first. Then pin to your blogs main board and finally to your group boards. Pinterest can be a lot of work but you can use scheduling tools like Tailwind . Post your content to your Facebook page. Promote your content on Instagram. This one is a bit more difficult as you can’t link from individual posts. If you make your image relevant to your post and use popular hashtags, it can be highly effective for brand awareness. Join Facebook groups for bloggers and take part in the promotional threads to help boost your traffic. Share your content on Reddit. Join relevant subreddits and link to your content. You must remember not to overshare as you can easily be marked as spam. LinkedIn. Not an obvious one but I get a surprising amount of traffic from posting to LinkedIn groups. Leave comments on other bloggers posts. This leaves a link to your site. StumbleUpon. I’m not a fan of this as it’s not good quality traffic and can raise your bounce rate. It does give you traffic though and some bloggers seem to swear by it. So by all means give it a try but I wouldn’t recommend it as a long term strategy. Ensure you have a link in all of your social media bios. Having social share buttons on each blog posts means your readers can promote your post for you. Guest posting will provide you with a backlink to your blog. Check Facebook groups for bloggers looking for people to guest post on their blog. Also don’t be afraid to approach bloggers in your niche if you wish to guest post on their site. Now all of the tips and places to promote in the world won’t help you if you don’t have an effective strategy in place. That’s where my friend Ana comes in! Ana is the blogger behind The She Approach and she’s passionate about helping new bloggers increase their traffic. So much so that she has written an ebook with over 100 pages of in depth strategies, tips and tutorials that will grow your blog like a weed. 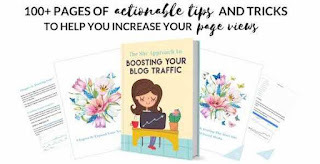 The She Approach To Boosting Your Blog Traffic is a thorough and easy to read guide to all of the traffic strategies you will need. Show you how to find your target audience and turn them into loyal readers. Give you a solid foundation for SEO so you can tap into all of that lovely free google traffic. Show you effective strategies for social media marketing which are easily automated and give you more time to create quality content. Give you an in depth Pinterest tutorial. Introduce email marketing and how you can use it to drive traffic and make an income from your blog. Offer you tons of bonus content. This ebook is for you if you feel like your blog is stuck and your efforts to promote your content aren’t producing the results you had hoped for. So there you go! I hope this has helped you take the next steps with your blog. Just remember that miracles won’t happen overnight. But with patience and hard work you will start to see results. And don’t forget, strategy is key. What is helping you get traffic to you blog? Let me know in the comments. The 3 Pinterest Courses Every Blogger Needs To Take.